On Saturday, November 10 at 1 p.m., two weeks after the Pittsburgh pogrom and 80 years after Kristallnacht, Jews, allies, and people of good conscience are engaging in a day of action and remembrance, as part of the International Days of Action against Fascism and Anti-Semitism. We will gather for an all-city rally at the Metropolitan Republican Club, site of last month’s Proud Boy attack, followed by a march to the West Side where we will end with a permitted memorial service at the Warsaw Ghetto Memorial Plaza. Rooted in Jewish solidarity with all oppressed peoples, we envision a better and more beautiful world — a world without pogroms, a future without fascism — where everyone is free to live with dignity. From the streets where we live and play to the places we work and pray, we will organize to defend all of our communities from those who would exterminate us. Saturday’s demonstration is part of an international week of action taking place in cities across the United States, and around the world. 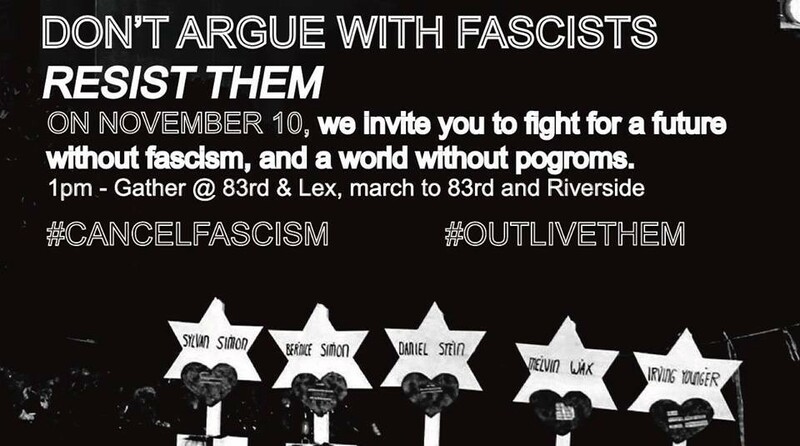 Organizers involved with Saturday’s march will continue meeting to build a broad coalition committed to fighting fascism on every front, locally and internationally.